Notes: The station was situated on the western side of The Wells Road and built between two tunnels, Thorneywood (408 yd) to the south and Sherwood (442 yd) to the north. The land for the station approach from The Wells Road was given to the Nottingham Suburban Railway Company by Nottingham City Corporation, who paid half of the maintenance costs. Additionally the historical St. Ann's Well was demolished to accommodate the railway. Opened on 2 December 1889 the station consisted of two facing platforms built linked by a wrought iron lattice girder bridge supported on cast iron columns. As planned the station was to be called The Wells Road, but by the time it opened this has been changed to St. Ann's Well. The station handled a full range of goods traffic including livestock. Unlike Thorneywood and Sherwood stations the up platform was of wooden construction giving it more of a temporary impression. The single-storey brick booking office and main waiting room was located on the down side. A brick waiting room stood on the up side with brick foundations on solid ground below the timber platform. Both platforms had wooden protective canopies attached to the buildings by ornamental brackets. 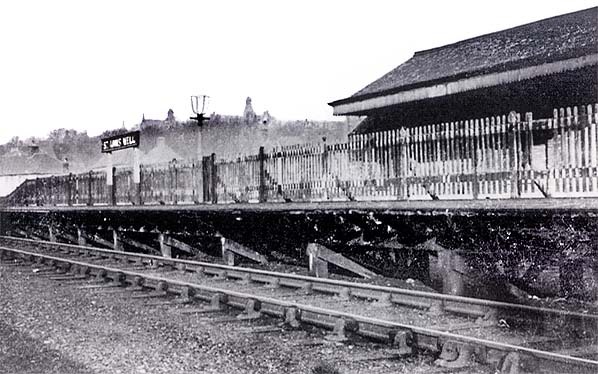 The 30-lever signal box was situated beyond the end of the up platform; this was opened with the station in 1889, but from October 1904 was operated by the stationmaster only when required to deal with traffic. Behind the signal box was the goods yard comprising three loop sidings with a brick goods shed between them. The shed had two canopies, one over the siding that passed it and one on the other side for the benefit of road vehicles loading or unloading in the yard. There was also a short siding on the down side serving the cattle dock behind the north end of the platform. The stationmaster's house was opposite the entrance to the goods yard in The Wells Road. Both the house and the station buildings were designed by TC Hine. Nottingham City Corporation Tramways began operating an electric tramcar to St. Ann's Well in February 1902 compounding the competitive effect that the arrival, in 1899, of the Great Central Railway had had upon passenger services. Consequently, owing to poor patronage, the station was closed to passenger traffic on 1 July 1916. After closure the station fell into disrepair with the station buildings and platforms slowly being demolished. In February 1930 the down line was lifted through the station, and at this time the platform was cut back. Surprisingly the wooden platform remained on the up side. In 1935 the goods yard was still handling a significant amount of traffic, much of it for Mapperley Hospital. It continued to do so until closure, although it was the quietest of the three stations on the line with 1,096 loaded wagons being received but only eight being forwarded. Dawson's Salt and Firelighter Works was located alongside the stationmaster's house and they had their own entrance into the goods yard. There were still four local coal merchants operating from the yard at this time. The up platform building was used as an additional goods shed hired out to Earles Cement merchant. The station house was occupied by stationmaster E Potts who was responsible for all three stations on the line. 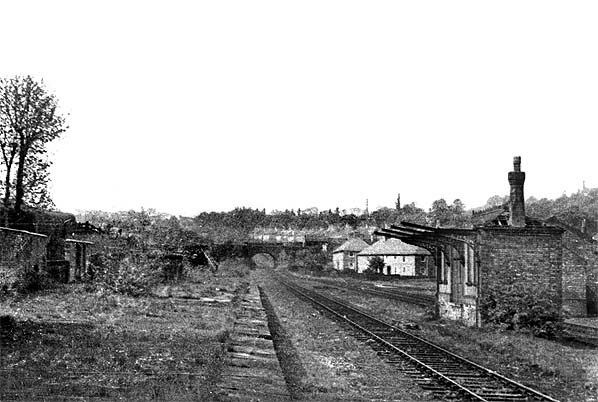 By the time that the line was closed in August 1951 only the down platform buildings and goods shed remained. 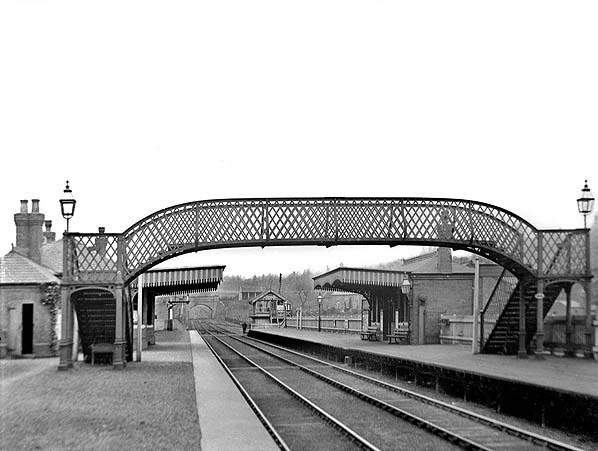 In the late 1960s the substantial skew-arch bridge, which took the line southwards over The Wells Road, was demolished. The station site was redeveloped in the early 1970s, but by 2011 the flats which were built had been demolished and in 2014 a new housing development is under construction. 1901 1: 10,560 (6") map showing St. Ann's Well station and the surrounding area. Sherwood Tunnel is seen to the north, with Thorneywood tunnel to the south. Click here for a larger version. 1900 1:2,500 OS map shows the layout of the station and goods yard. 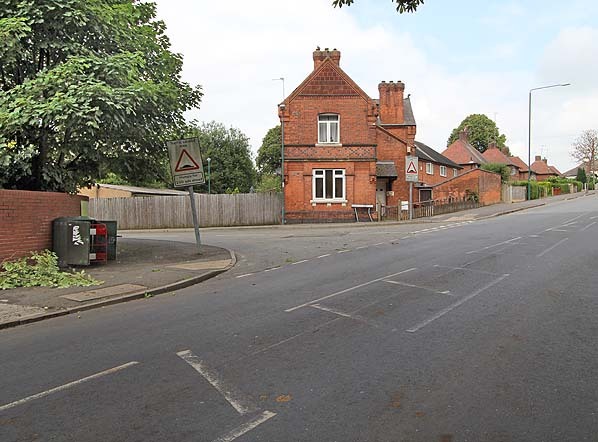 There is an approach road running north from The Wells Road to the station forecourt. There are facing buildings on the two platforms with a footbridge spanning the line to the south. The goods yard comprises three parallel loop sidings, two of them behind the up platform passing the goods shed; the third loops round the west side of the shed. There is also a short siding on the down side running behind the north end of the platform. Access to the goods yard is from The Wells Road. A weighbridge and office is seen just inside the entrance to the yard opposite the stationmaster's house. The signal box is seen at the north end of the up platform. There is a substantial skew-arch bridge across The Wells Road to the south of the station. Click here to see a larger version. 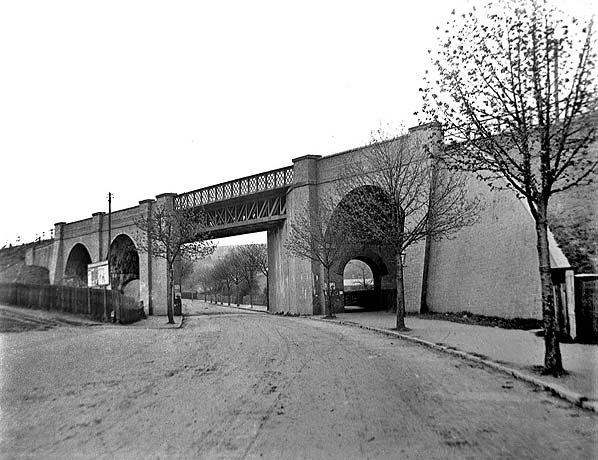 The massive skew bridge taking the line over The Wells Road in 1904. The entrance to St. Ann's Well station is a short distance along Kildare Road, which is seen on the left. The timber up platform at St Anns well after closure. Surprisingly the platform lingered for some years. The goods shed is seen to the rear. St. Ann's Well station looking north along the down platform in May 1952, ten months after complete closure. The down platform building has been demolished. The up platform building is still standing although devoid of its canopy but the timber platform and signal box have been demolished. 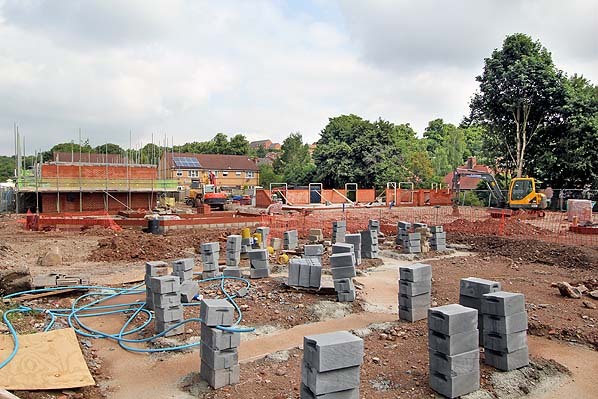 The brick goods shed can be made out behind the waiting room but new housing has already started encroaching on the goods yard. Bentley's bridge is seen in the distance. 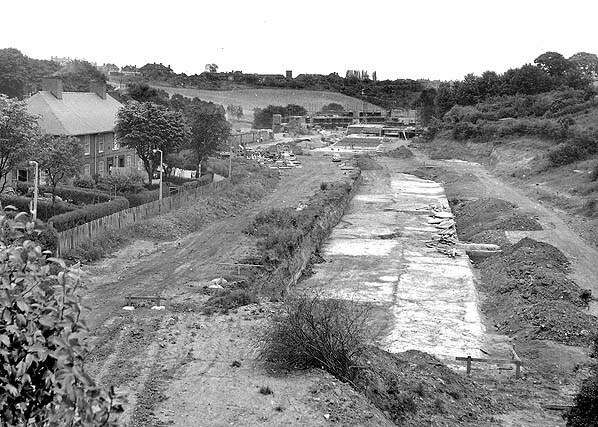 Looking north towards the St. Ann's Well station site during redevelopment c1970. 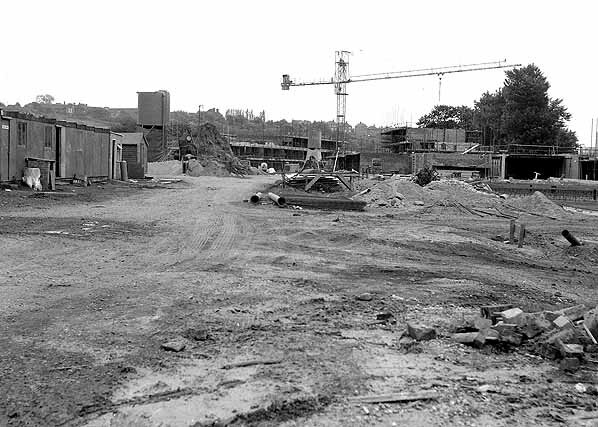 Redevelopment of St. Ann's Well station site is underway c1970. Looking into St. Ann's Well station site from the end of the approach road c1970. 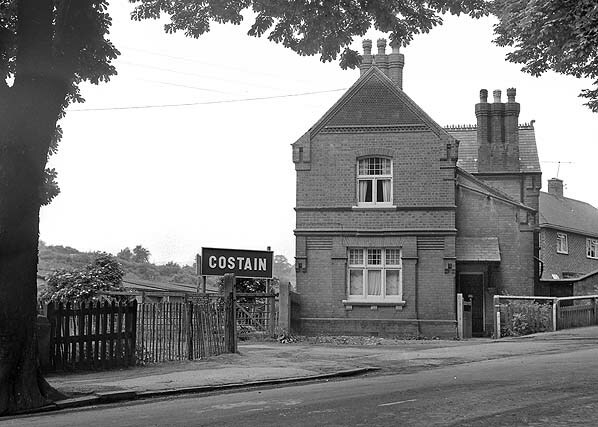 By c1970 the only remaining evidence of St. Ann's Well station was the stationmaster's house in The Wells Road. The entrance to the goods yard was in front of the house; the original gates were still in place at this time. 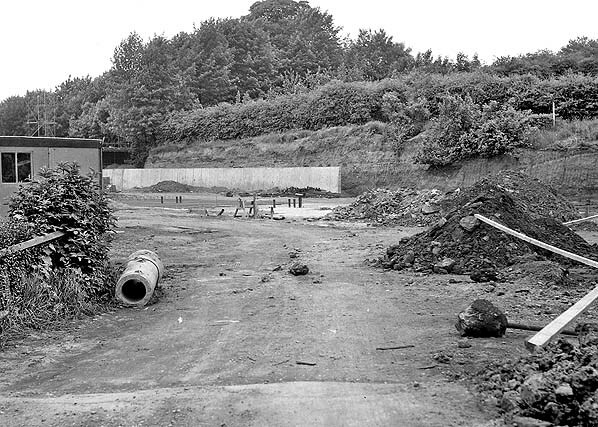 Looking north at the site of St. Ann's well station site in July 1981. 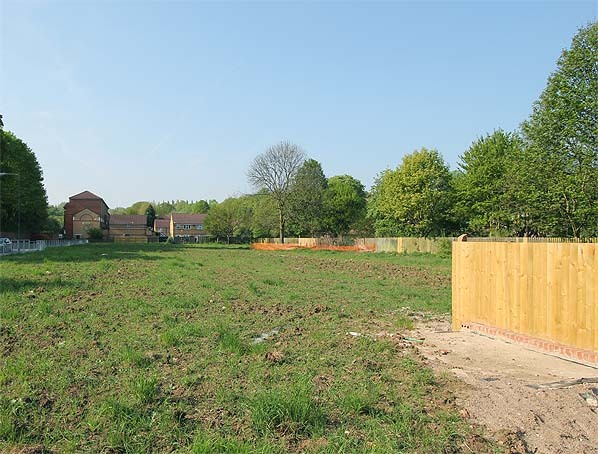 Looking north at St Anns well station site in April 2011 from a similar viewpoint to the picture above. 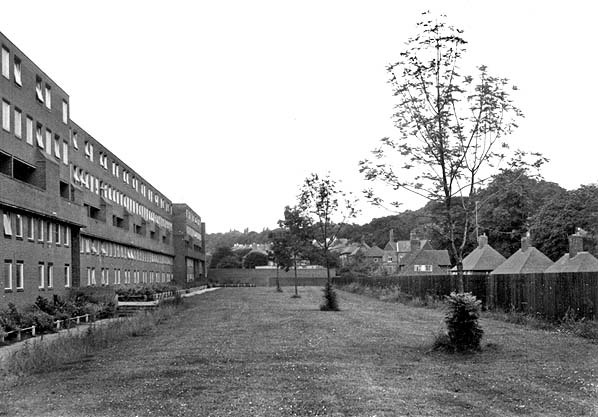 The flats, built in the 1970s, have been demolished and the site awaits new development. Looking north at the site of St. Ann's Well station in July 2014. St. Ann's Well station house and the entrance to the goods yard in July 2014. The photo is taken from the same viewpoint as the c1970 picture above. The entrance to the goods yard is now Dooland Drive.